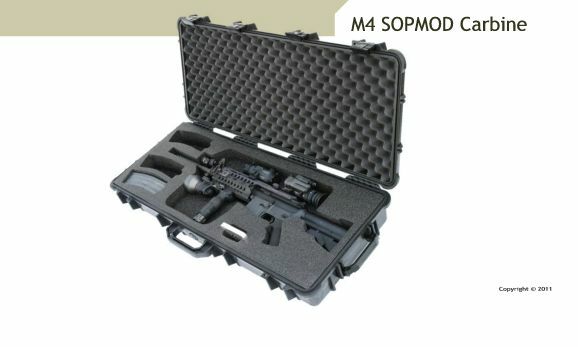 Double Gun Case holds one (1) M4 SOPMOD with storage for 7 magazines. 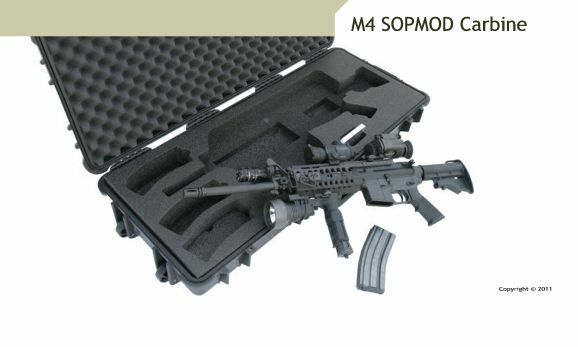 The SOPMOD GunCruzer hard-shell case allows the SOF operator to configure his M4A1 carbine based on his mission-specific requirements. 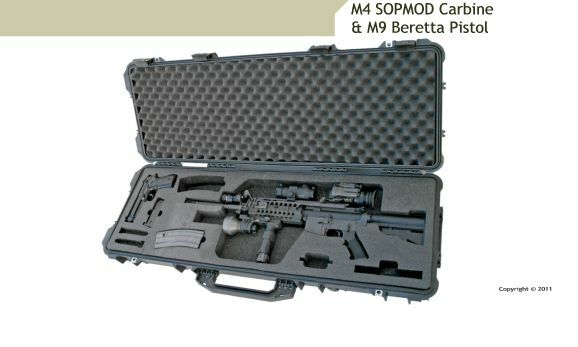 The case arrives with special custom-foam interior designed to accommodate a SOPMOD M4 carbine with RIS; forward handgrip and collapsible stock; and accessories such as ACOG optical sights (mounted on top of rail), AIM Point (mounted on rail) visible laser lights; the M203 grenade launcher; and seven (30 rounds) magazines – a requirement for soldiers deployed to Iraq or Afghanistan. Other models will also accomodate the M9 Beretta pistol. The custom foam interior is made out of high-density closed-cell Polyethylene foam bed is easy to clean, yet impervious to solvents and chemical attacks. The lid’s interior cushion is egg-crate-style convoluted foam.